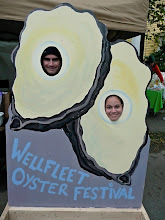 - Fresh oysters from Duxbury, MA, razor clams by the pound, or try the "Yankee Thanksgiving sampler" which contains one dozen of three oyster varieties (Island Creeks, Moon Shoals, and Chathams) from Cape Cod, a shucking knife and gloves. With all that other food, three dozen is the perfect amount to add to your Thanksgiving wherever you live. - Live mussels, oysters and clams shipped daily fast and fresh. - Fresh shellfish from the Pacific Northwest including: oysters, clams, mussels and geoduck. - Read a review from our blog. - Your order will leave the farm and arrive the next morning to your kitchen, anywhere in America. - Enter Promotional Code: GoShuck to receive a free oyster shucking knife. - Fresh ocean oysters and clams from VA.
Don't forget your oyster shucking knife and glove. Pick up a few for yourself and your holiday guests.